Wedding dress of ivory figured silk with a pattern woven 'en disposition' of formal flowers with an undulating band above and a scalloped band below. The evening bodice has a low, wide, pointed neckline, short straight sleeves covered with gathered bands of matching tulle, and a point front and back. The waist is trimmed with a double rouleau of self material. The bodice is boned at front and side and back seams and lined with white glazed cotton. The neck is trimmed with a narrow frill of blond lace through which a black velvet ribbon passes. There is a lace fastening at the centre back with a hook at the top and bottom. On the front are stitch marks suggesting a jewel, flower or other trimming were attached. The skirt is flat pleated except at the centre back where it is set in organ pleats. It has three flounces, the pattern en disposition, each trimmed with matching silk fringe. The dress is lined with tarlatan. T.10A-1970 The jacket bodice has a cape and basque trimmed 'en disposition' and with white silk fringe. The neck is high and the jacket fastens down the centre front with concealed hooks and eyes. Circular motif with pendant balls are stitched to the front, two more at the back waist. The sleeved are elbow length with a gathered top and a wide frilled fringed cuff. Body lined in white glazed cotton, skirts with silk. The outfit was worn with an orange blossom wreath. 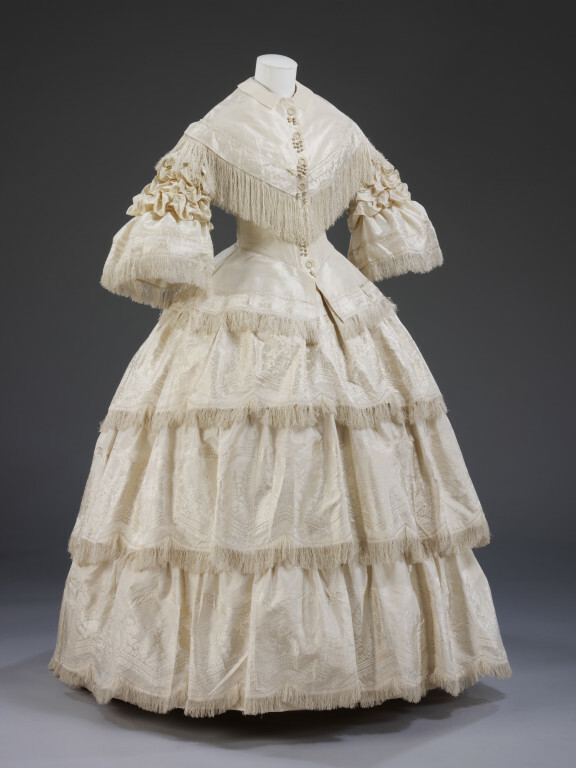 Bridal styles in the 19th century followed fashion. 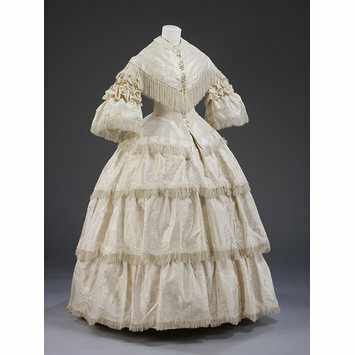 The cut and decorative details of Margaret Scott Lang's 1857 dress are typical of their date. Her wreath of artificial orange-blossom was probably worn with a veil. Orange-blossom was prized for its fragrance. Scent was sometimes applied to artificial orange-blossom to recreate this.